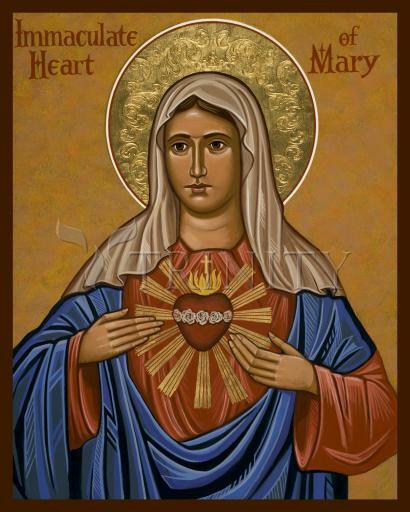 First of all, Mary’s heart is visible outside of her body. This points to her undying love for all people. Her love is such that she cannot contain it within. Some artists choose to depict the Blessed Virgin carrying her heart in her hand or simply pointing with a finger to her heart. The gesture suggests that Mary wants to give her heart to the one who is viewing the image. Next there are white roses that encircle her heart. These symbolize her purity, brought about by her Immaculate Conception, creating within her a most pure heart. In some cases, her heart is also shown with a lily coming out of the top, also symbolizing her purity.